Freshman center Shaq Miller-McCray being embraced by senior centers Haley Gerrin and Taleah Williams on Dec. 22. The Georgia State women’s basketball team (4-7) loss to the Elon Phoenix (7-4) 84-67 in the last game of GSU Holiday Classic. Freshman guard Jada Lewis led all scorers with 21 points and freshman center Shaquanda Miller-McCray set new career-highs with 7 points and 6 rebounds in the first half. 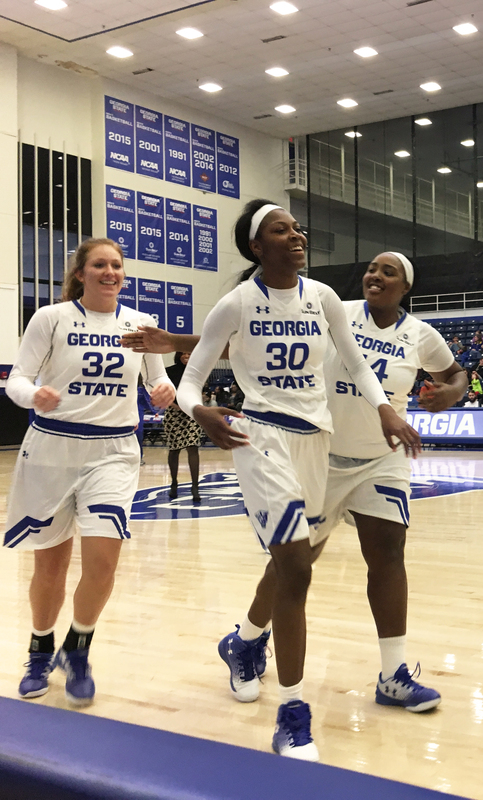 Junior guard Makeba Ponder finished the game with 13 points, shooting 4-for-13 from three-point range and she also received tournament honors for her play during the GSU Holiday Classic. Ponder had 15 points in the Classic’s opener against Akron. Sophomore forward K.K. Williams had a solid all-around performance, finishing with 13 points, 8 rebounds and 2 assists. Although the Panthers are now three games below .500, the promise of the young core is evident and there are still three months left before postseason play. The first Sun Belt match-up for the Panthers will be on Dec. 31 in Statesboro to face Georgia Southern.